Is there a better alternative to Curator? Is Curator really the best app in MP3 category? Will Curator work good on macOS 10.13.4? Curator is the artwork manager for iTunes. Curator downloads album covers from the Internet and adds them to your iTunes music library. Curator is the solution for people who like to micro-manage their artwork collection, or have obscure albums with hard-to-find covers. 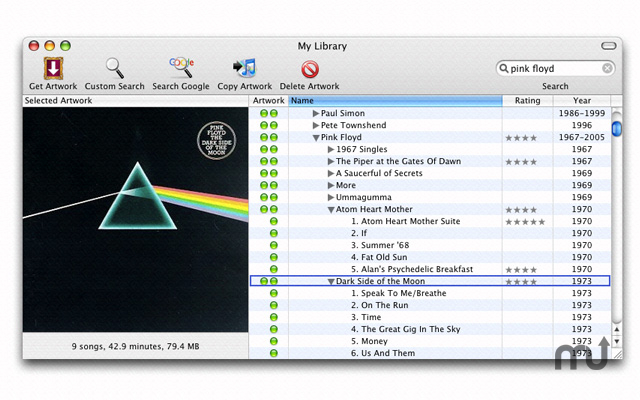 It is unique in letting you manage artwork in your library on an album-by-album basis, so you can download as much or as little artwork as you want. Indicators show you at a glance which albums have missing artwork. Curator needs a rating. Be the first to rate this app and get the discussion started! Curator can even find artwork for unusual albums by looking them up on Amazon.com, the largest collection of music on the internet. Curator also helps you find artwork for foreign titles by searching all of Amazon.com's international sites. Curator can handle special editions and multiple artwork for one album. It can show you when it finds several answers and lets you choose the one you like best. Curator lets you take full advantage of Cover Flow, Front Row, and the Apple TV keeping your artwork collection complete. Curator is also designed to add artwork directly to your iPod, so you can see artwork on your iPod display while your music plays.